When a Pac-Man cookie cutter meets a classic biscuit recipe only good things can happen, trust me. After successfully transforming the humble custard cream last year into a geeky tea time treat, I thought it was about time that the jammy dodger got the 16-bit treatment too. Novelty cutters aside, this is the best jammy dodger recipe I’ve found and comes courtesy of Justin Gellatly and his wonderful baking book Bread, Cake, Doughnut, Pudding, so, even if Pac-Man isn’t your thing, I can guarantee that this recipe will be. Either in a food processor, or a stand mixer with a paddle attachment, mix together the flour, butter, icing sugar, egg yolks and salt until a ball of dough forms. Flatten the dough out into a fat disc, wrap it in cling film and chill in the fridge for an hour. Take the dough out of the fridge and allow it to soften for half an hour before you roll it out. Preheat the oven to 160ºC / Gas Mark 3 and line two baking trays with parchment paper. Roll the softened dough out to a thickness of around 4mm and cut out the bases for your biscuits. Repeat this process to cut out the tops, and using an 8cm piping nozzle cut out two eyes on each ghost, and one for the Pac-men. You should have enough dough for 18-20 complete biscuits. Sandwich each base and top together with a tsp of raspberry jam, pushing the top down so the jam rises out of the holes slightly. Then, pop the biscuits back into the fridge for 5mins to firm up before baking them for 20mins. As soon as the biscuits are out of the oven, sprinkle them with caster sugar and allow them to cool on a wire rack. 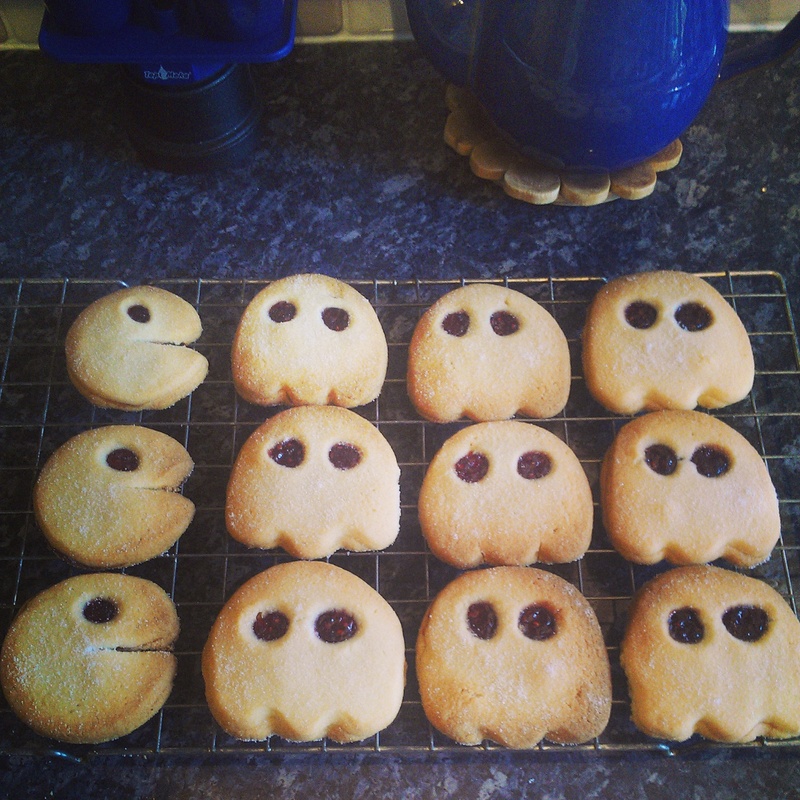 This entry was posted in Biscuits and tagged baking, biscuit recipe, biscuits, jammie dodger, jammy dodger, jammy dodger recipe, Pac-Man by Natalie Glock. Bookmark the permalink. He does indeed & that sounds great!